MediaMonkey Review - The Best Music Organizer in 2018? MediaMonkey Review – The Best Music Organizer in 2018? Is MediaMonkey the best music organizer in 2018? That’s what we are going to find out in this blog post which is a review of the free version of MediaMonkey. Right off the bat, MediaMonkey is a windows based software that organizes your media files for serious collectors. Going further, we found out that MediaMonkey manages audio files such as music/songs, videos, and playlists in small to large numbers and this is where the “serious collectors” comes to play. Some of us are music aficionado – which means someone that’s passionate about good music and as such we tend to have songs in the hundreds and thousands on our computers. How did we get thousands of music? By ripping a bunch of Audio CDs and with time duplicates would creep in and since you haven’t started organizing your music from the very beginning, holding it when you have thousands of songs can be tough if you want to do it manually, but that’s where MediaMonkey shines and helps out. Media Monkey can help organize your messy music library. 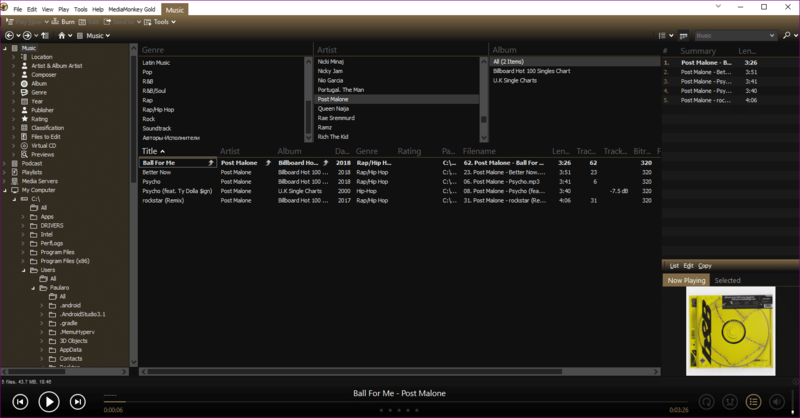 Media Monkey can help you handle duplicated songs, albums, and playlists. It can handle your entire music library(100,000+ songs) without slowing down. You can sync with your smartphone or tablet. You can share music files via Digital Living Network Alliance (DLNA). 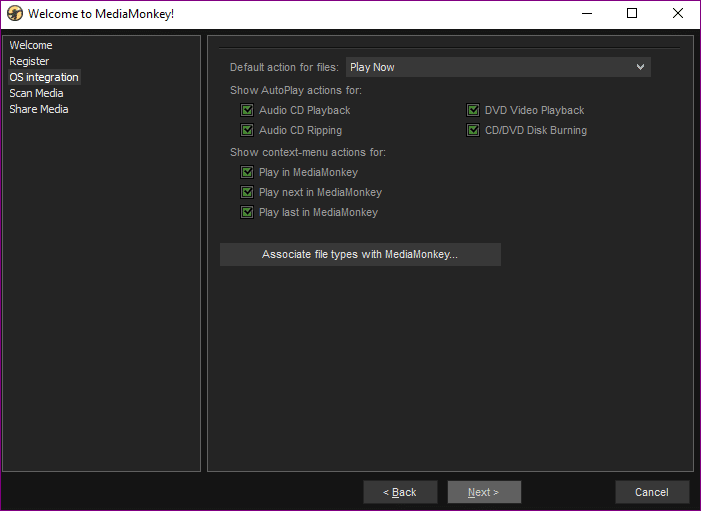 MediaMonkey converts audio and video files to any format you want. The very first thing you need to do is download and install MediaMonkey – DOWNLOAD LINK. Media Monkey can be installed on Windows XP, Windows Vista, Windows 7, Windows 8 and Windows 10 Operating Systems and it supports both 32/64 bit version of Windows. Installation is straightforward, follow the installation wizard and you should fine, now it’s time to run Media Monkey for the first time. On the first launch of MediaMonkey, follow the wizard because it would help you get started by setting a few options and scanning your computer drive for music files. 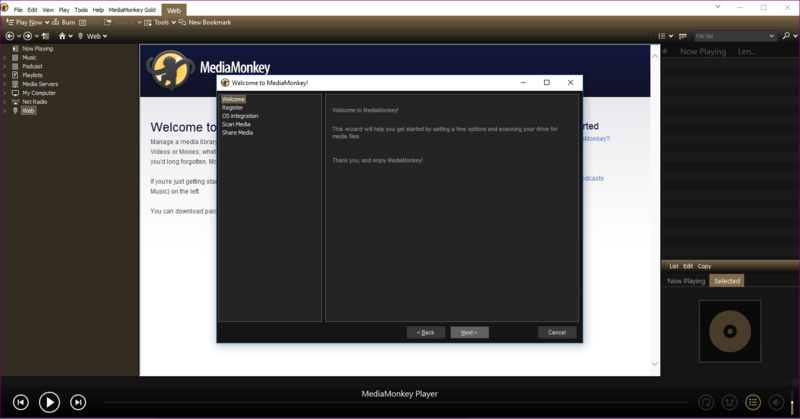 MediaMonkey is a free software that already gives users a robust feature list but for even more advanced and useful features, upgrade to MediaMonkey Gold. At this stage, if you are a free user, click on NEXT because only GOLD users have license keys. 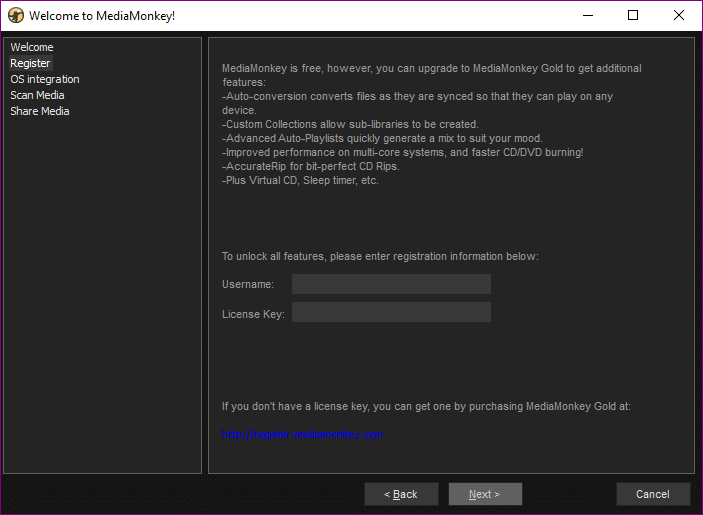 You can buy MediaMonkey Gold, also check out the impressive features you can get with GOLD. This is where you choose the default action for files, decide what autoplay actions are for, what show context-menu actions are for and select the files you want to associate to MediaMonkey, i.e., what particular file format do you want MediaMonkey to be in charge of. Scan continuously: Which means the scan doesn’t end, it keeps on scanning in the background so when a new song is added to that folder, it gets added automatically. Scan at startup: This means on every system startup, the folder you chose is scanned so that any new song added would be automatically added. You have to option to either share your library or not share your library. If you don’t tick share your library, when you use MediaMonkey for Android app or try to sync from any other device you won’t have access to your media library. I recommend you tick share your library. Now you are done setting up MediaMonkey. 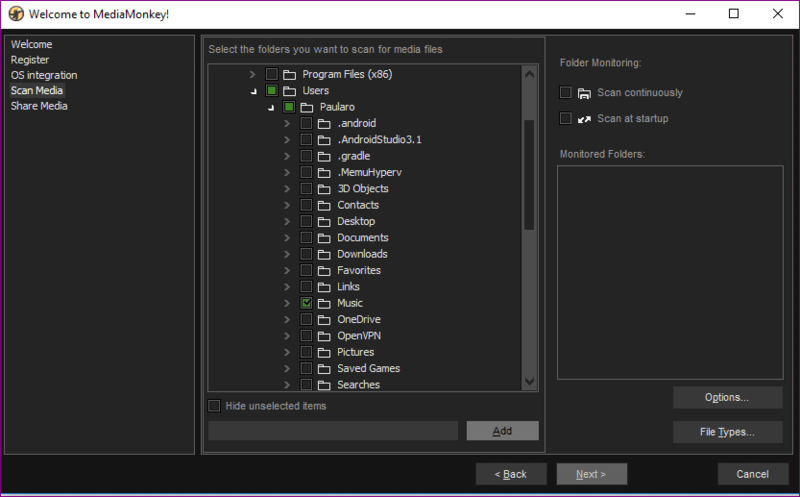 Media Monkey scans the selected folder within your drive and brings out all the media files within the folder. You can organize your music library by Genre, Artist, Album and it’s done in a simplistic manner which makes everything easy to see. Media Monkey can easily be called one of the best music organizers in 2018 because of the share number of songs (100,000+) it can handle without slowing down. I wish I had over 100,000+ songs so I could push the limits of this software, but one thing I don’t like is having too many songs on my computer at the same time because it confuses what songs you should listen to. One downside of this software is it’s available for only Windows users so Mac users cannot use this software to organize their music library. Linux users can use Wine to run window software on their operating system. I have the gold version and have been disappointed so far. It almost never finds the correct album when ripping your cds to the library and artwork, just forget it. I have spent hours just adding 2 or 3 cds. Then you had better listen to every minute of what you have ripped to find the errors in the songs that did not convert properly, missing and distorted seconds in some songs. After careful ripping and re-ripping you have the album on your computer. Then begins the search for album info. After each cd rip, when inserting the next cd into the cd drive, media monkey can’t find the cd player. I then re-boot the pc and media monkey recognises the player again. Siteground vs Hostgator: Who has the Best Web Hosting in 2019?